Your wedding flowers can turn into a major portion of your wedding budget. There’s a good reason for that. The type of flowers in your bouquet and in your decorations immediately emphasize and enhance your wedding theme. The beauty of flowers simply adds so much to your wedding day. When it comes to flora, there is such an abundance of choice, you can usually have exactly what you want. Of course, be aware that the cost of in-season flowers will vary a great deal from out-of-season flowers. Not only are flowers beautiful and exotic, they are fragrant. A reception venue filled with floral arrangements will be filled with an inviting scent. With some many options for flower arrangements, your wedding florist can make or break your wedding day. You need a wedding florist who understands want you want and the look you are trying to achieve. 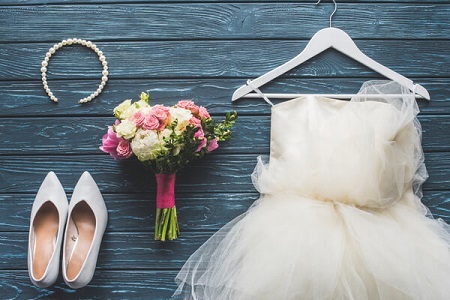 Planning your perfect wedding entails so many things – from creating a guest list, finding a venue, and deciding on a menu, you can easily overlook the importance of your wedding florist until it is too late. Florists who cater large events can be booked up months in advance. 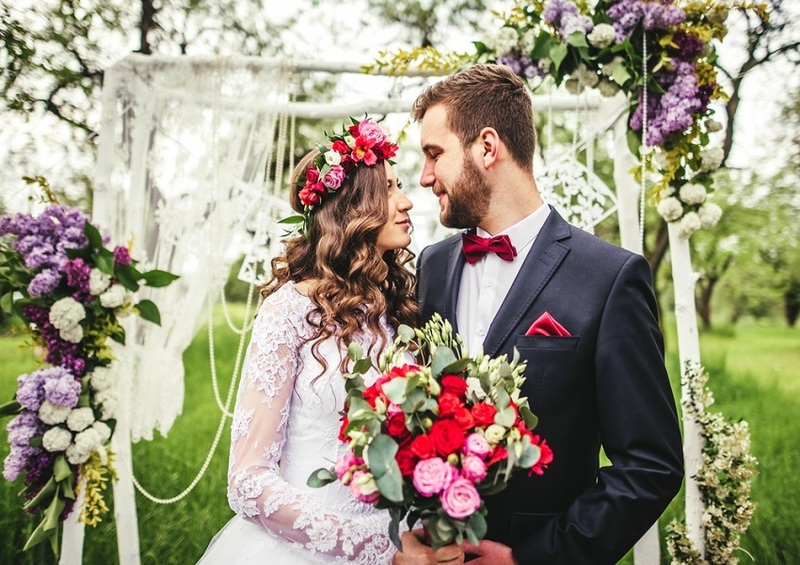 So, it’s best to make time in your hectic planning schedule to find that wedding florist that is perfect for you and will brighten up your wedding day. You want the ultimate look to be beautiful, impressive, and reflect the essence of your wedding theme. Flower arranging is an art form, so you want to create the most beautiful portrait possible. Start with a budget. The cost of your wedding flowers is directly related to what flowers are in season and you should have an amount in mind before you begin your search. Out of season flowers can double or even triple the cost. First, search for some wedding flower ideas using this nifty visual search tool. Your wedding flowers should blend into your overall theme. Consider what you want your wedding florist to do. Should he or she merely provide the flowers for the wedding, or do you want help with the overall design and look? Your neighborhood florist may not be able to handle elaborate decorations, centerpieces, bouquets, and boutonnieres. Get recommendations from recently married friends, the internet, or your wedding venue. 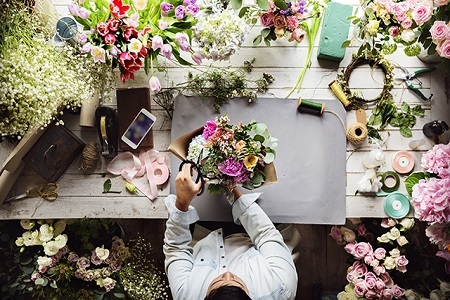 Should you go with a wedding florist who has 20 years of experience or an eager, hungry newbie trying to catch a break? They both have their pros and cons, and you may ultimately have to go with your gut feeling. An experienced wedding florist may have been doing arrangements for decades. They will certainly know what to do, so that’s a huge plus. On the other hand, he or she may not be open to new ideas and will push the ways things have always been done. He or she may also have several other weddings during the same time period, and you could end up just one of many. A newbie may lack the experience that you need in case of emergencies, which is a serious consideration. On the other hand, he or she will be more open to new ideas and will work twice as hard on your floral design. 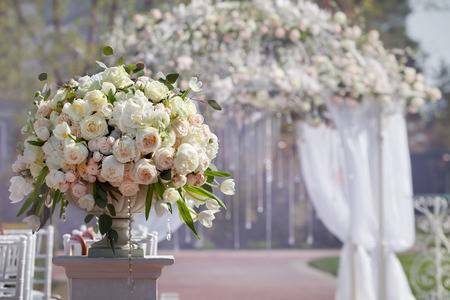 A less experienced wedding florist will have a lot more at stake than the experienced counterpart and has every reason to go to great lengths to fulfill your wedding vision. Your best bet is to check out references carefully. Ask former bridal couples about their experience, especially how the wedding florist handled unexpected circumstances and problems. Check out your choices on social media. Thanks to modern technology, you can go to Facebook or Instagram and see your wedding florist(s) creations. You may also see comments from other clients that will be helpful to you. Once you have narrowed down your choices, book your wedding florist interviews about nine months before the wedding. You should meet with at least four wedding florists to get an overview of what is available to you on your budget. Bring your ideas, photos of floral designs that have inspired you, pictures of your wedding gown, along with fabric swatches, if possible. Discuss your vision for your dream wedding. The more your wedding florist knows about you, the more ideas he or she will have. Review your wedding florist’s portfolio. You want to be inspired by what he or she can do for your special day. 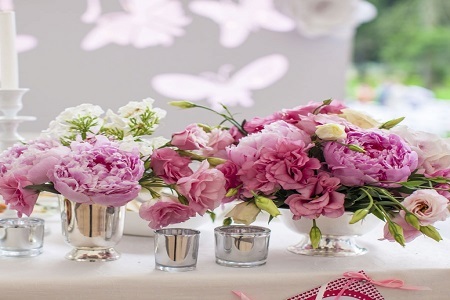 By the end of your first meeting, you and your wedding florists should have a firm idea of the style that you want. The style and colors should be incorporated in your centerpieces, decorations, and bouquets. Classic floral designs tend to be round and feature white roses. Romantic floral designs are less structured than classic designs, with lots of pink and neutral flowers. A natural floral design will have more greenery. For a bolder, out-of-the-box design, choose dramatic colors with a nuance of neutral shades. For a modern look, consider bolder colors and a cascading design for your wedding bouquet. Price will be an important part of your hiring decision. If cost is an issue, discuss in-season floral arrangements, which will be much cheaper. Ask about adding less expensive blooms, such as carnations or tulips, to your bouquet or décor. Get a breakdown of all of the costs. Ribbons, wires, and vases may add considerably to the quoted price. Ask about the labor involved in transporting the flowers, setting up the decorations, breaking everything down, etc. Exactly what services can you expect from your wedding florist? Make sure you know who owns the accessories and vases. Will the wedding florist be retrieving everything following the reception, or are they yours to keep? A tremendous discrepancy in price can be reason for an immediate elimination if all else is equal. Schedule a follow-up interview with your top three choices, where experience, talent, and price are in alignment. They should come prepared with a proposal that embraces your vision and budget. Discuss any changes you may want, such as decreasing the centerpieces in favor of the overall floral decorations. No final price is written in stone. Before making a final decision, ask what can be done to save money. Adding greenery to your flowers or getting smaller centerpieces can affect the final number. Also ask if the bridal bouquet can be used to decorate your table, while the bridesmaids’ bouquets may be used for other decorative purposes. Small touches can save you big money. If you are undecided between two wedding florists, here is a hint: There are always ways around the cost; but the final piece of art created by your wedding florist will make your wedding day and live forever in pictures and videos. If it comes down to price versus style, go with the style that most appeals to you. You can always find a few extra hundred dollars in your budget. But nothing will recreate that perfect piece of wedding floral art. Your chosen wedding florist will provide you with a contract. Make sure it includes substitution for any flowers that aren’t available and an itemization of all of the costs involved. Finding the right wedding florist can turn your wedding day into a beautiful extravaganza.